Just completed the VFO/BFO/Arduino/OLED module for my radio. I also have the LPF, BPF and crystal filters completed and tested. Next will be the audio amplifier and NE602 modules. I will probably build one of the NE602 modules and test things out as a DC receiver. My ultimate plan is to have the rig no more that 1"x3.5"x3". I still have a lot of "stuff" to stuff into that size of box. I'll keep you posted. I have been able to contain the entire Arduino/Si5351/OLED into a small cube in the front. The rest of the radio has to fit on two levels in the rest of the area behind the Arduino/Si5351/OLED. I think I will build the audio section and on NE602 mixer and run it as a direct conversion first to vet out any noise or other problems. Bill, that small coax that you pointed out will really help on this build. I used a small piece as a power feed-thru and will use it to feed out the VFO/BFO signals, thanks again for that pointer. I decided to test for noise on the TIA transceiver test bed. See the video of the results. Not too much noise. I'm only using my indoor magnetic loop for an antenna. Video is kind of sloppy, but taking off the antenna and turning up the volume shows how little noise is left in the system. Now time to stuff the rest of the radio into the tight quarters. IIC interface. 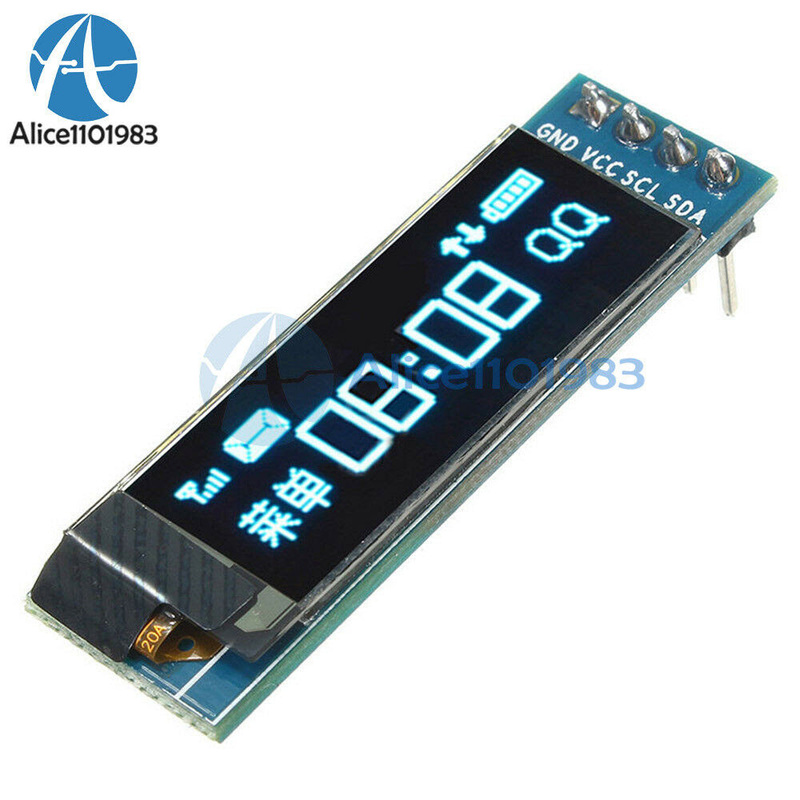 OLED display, no need backlight, self-illumination, the display performance is better than the traditional LCD display, also lower consumption. VCC: Power (DC 3.3 ~5v). Display Color:Blue. | eBay! They are nice and compact, although as time goes on, I'm sure they will be harder to read. I'm hoping to have an alfresco version in a week or two. I used much of Pete's code from the shirt pocket transceiver upgrade, modified the code to address the smaller display and add USB/LSB capabilities. The size of the rig has changed, 1.25"x2"x4". Still not sure if I can stuff it all inside that small a space.